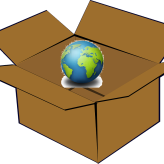 Home » Posts Tagged "think outside the box"
We just moved our CEED and Nourish The Planet headquarters to a new location. We moved from the Warehouse in Loveland to our nearby Mountain Sky Ranch property in the foothills next to Loveland (Berthoud, CO). Our workplace has been at Mountain Sky Ranch since August 1 2004. Our new property is much larger than the old one, so much to that we need to ride bikes between different areas on the ranch. When people move out of an old house or office to a new one, they are often tempted to toss their old stuff into a dumpster. It is important to plan your move so that you are able to recycle and reuse most of your unwanted stuff before you move.